Posh chairman Darragh MacAnthony (right) with manager Grant McCann. Posh chairman Darragh MacAnthony expects Gwion Edwards to have a great season. “Grant McCann handled himself brilliantly in difficult circumstances last season. “He made mistakes like any young manager would, but I’ve been happy to give him the time to learn from his mistakes because he has always had the respect of his players and of the supporters. “Grant won’t make the same mistakes twice. 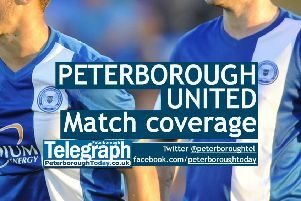 Posh midfielder Jermaine Anderson needs to sort his future out quickly according to his chairman. “Like many young players we have signed in the recent past, Grant has the potential to get to the top of the game. I wish I could put a sell-on clause into his contract. “He works hard, but he also knows the hardest worker, or even the smartest man in the room, doesn’t always deliver success and that will always be the bottom line in football. “Grant knows 11th place is not good enough for this club. He knows we want promotion. “I’m a lot happier with his backroom team this season. David Oldfield is a massive signing for us. “Despite so many issues we finished just 11 points outside the top six and those 11 points were dropped against teams in the bottom four. “We did well to get to a certain point before Christmas last season before we dropped off. “Grant is a fan of the midfield diamond and I am a big fan of 4-4-2. “But we are a very analytical club and we looked at the formations used by some teams promoted from League One and League Two in recent seasons. “Bristol City and Sheffield are two notable clubs to have won League One playing with three centre-backs and wing backs. “We have that option and I am excited about seeing Leo Da Silva Lopes and Gwion Edwards playing in wide roles. “I know they will have to defend well, but in my mind they will both be playing as wingers. “We will have a couple of other formations as well, but with the quality of defender we now have at the club we should be rock solid playing three at the back. “Losing Jermaine Anderson was a blow to the midfield diamond system. He was a key to making that work and hopefully he will come back from his latest injury with a positive mindset and he will sign a new contract. “I’ve shown my commitment to anyone still wondering about it, by helping to build a strong playing squad, but by also transforming the training ground which now looks amazing. “The training ground has come on leaps and bounds and the stadium will be next. If I was planning to leave I wouldn’t bother with any of this. “Crowd size has obviously been disappointing, but it is what it is. “The people of Peterborough have shown they will support a successful team. “We have budgeted for 5,500 gates this season, but if we are challenging at the top we will get 7,000 crowds.